No one who works in early years would dispute the idea that reading, stories and nursery rhymes play a fundamental role in childhood, and that they form a vital part of early education. In the early years setting that I help to run, they are a key part of our daily offer to our children and their families. When parents arrive to drop off their children, they choose a picture book together from the box, to take away with them and share at home. We give advice and support to parents on reading with their children. We read a story to the children every day, and we share nursery rhymes daily at snack time, using Makaton signs as we sing. However, what we do not do is to instruct the children in vocabulary, and get them to repeat it. We don’t need to! New words appear as if by magic at this age, when practitioners talk to and with their children during hands on activities. When I went into preschool earlier today, our lead practitioner was talking with the children as they made snacks together, using language around cutting, food and colours, and the preparation and sharing of a meal. “It’s a purple pepper!” the lead practitioner said, merrily playing with vocabulary. “No it’s not – it’s red!” the children informed her in response. Where a taxpayer funded organisation says that its approach is based on evidence, and it puts videos into the public domain to show the thinking behind its new inspection framework, it is important that the claims made can be backed up with evidence. I cannot find any evidence to support the claim that listening to stories is “the most rapid way to increase” a child’s vocabulary, especially in the early years. Yet this is a claim that is made and emphasised not once but twice in the video, over footage of our youngest learners. Despite requests for a link to the research to support this claim, Ofsted have been unable or unwilling to provide it. 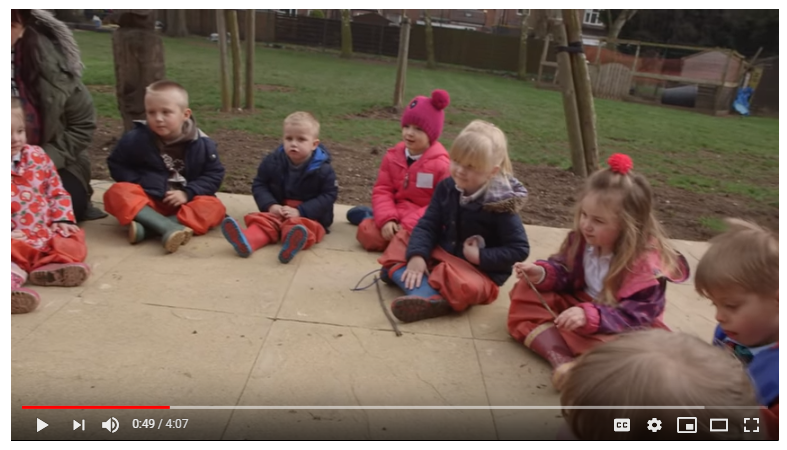 The video has already had over 2,000 views and some of those viewers might have taken away the message that Ofsted wants more sitting and listening to develop early language, and less hands on interactive learning. This is a lesson that Ofsted do not appear to have learned from the images on the cover of Bold Beginnings – that the medium (the pictures, the video, the very words that you choose to use) contains the message that you want to send. Unless, of course, this is the message that was intended. If it had been phrased as “one useful way” there would be nothing to see here. Why does all this matter? Why all the fuss? Why not wait and see what the consultation materials say next week? Well first and foremost, because ‘consultations’ have a habit of turning into a fait accompli, when it comes to this government. And also because, more than a year since publication, concerns about Bold Beginnings rumble on in the early years sector. These concerns are particularly around the potential for the report to lead to increased formalisation within the phase, both in Reception and via a ‘trickledown effect’ to an ever younger age. I am already hearing teachers and parents report that children are doing more formal phonics instruction in nursery, and yesterday I heard that in one Reception class play ‘stops after Easter’ in order to prepare for Key Stage One and SATs. Sector concerns are not going to be ameliorated by videos that seem to encourage more teacher led input and explicit instruction of vocabulary, without any evidence to support what we are told is the most rapid method to learn new words. The video explains that our “educational programmes” should “focus on increasing children’s vocabulary” and we are shown how this should happen in the film. 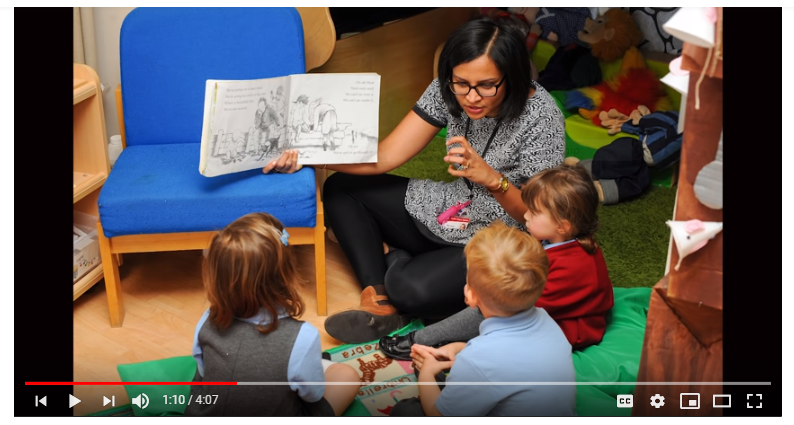 While reading stories to our children is a valuable and wonderful part of the EYFS, and a great way to give children access to new words and new worlds, it is not the only or the main factor in language development from birth to five years old. There are a range of ways in which language acquisition happens in the early years, but at heart it is about warm and attentive interactions between children and their carers, particularly during play. ‘Serve and return’ conversations, sustained shared thinking, role play and talk during hands on experiences – all these will contribute to children developing vocabulary. Although stories play an important part, early language acquisition is not about being static, listening to an adult, following instructions, or memorising words given to you out of context. It is about using language within rich, meaningful, enabling environments in the company of supportive adults, whether that is them reading you a story, or working alongside you as you play and learn. When the medium is video, the words and images chosen matter, and to me the message is clear: the new Framework comes with an agenda, but without the evidence to back it up. This entry was posted in Bold Beginnings, EYFS, Ofsted. Bookmark the permalink. Thank you. Well put and very true.